The OptiPlex FX160 delivers essential performance and flexibility to help keep your business running. OptiPlex FX160 is designed to ensure data and system security, independent of location, to help protect your critical data. Data is centrally located in the data center, which reduces data security risks from user theft or mismanagement, and alleviates business continuity concerns, such as distributed data and/or data loss. Symantec™ Endpoint Protection for Windows® XP Embedded defends against hackers and worms, Trojan horses, viruses, and other malicious code attacks. Optional Smart Card keyboards protect access to your critical data. Security lock slot provides physical system protection for Kensington-style locks (sold separately). Optional cable security kit, made of hardened steel, is designed to secure commonly used keyboard, mouse, and other PS2 or USB devices from theft. Designed for single-application workloads, the OptiPlex FX160 features new Intel® Atom™ processors. Scalable Dell Flash storage (NVRAM) options are available for flexible, high-end thin-client usage models. 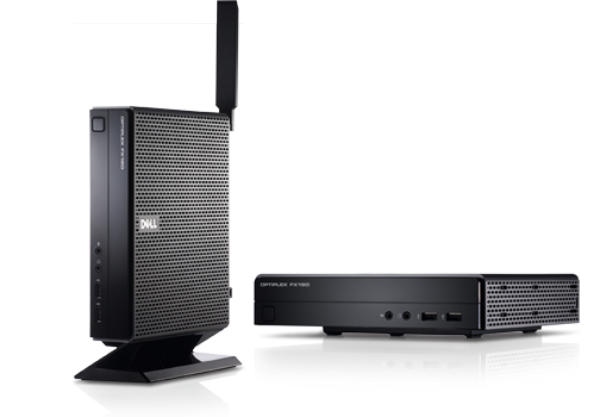 Altiris™ Deployment Solution is available on select models with embedded operating systems and offers IT managers an easy way to deploy images to the OptiPlex FX160. Select client licensing are enabled and included with each OptiPlex FX160 purchase. Desk-side deployments are made less painful with Dell USB-image transfer utility. Centralized image management simplifies complexities around client deployments with plug-and-play installations with Dell Client Manager on select ODDS models. Integrated power supply and optional mounting options make the OptiPlex FX160 an easy choice when it comes to maximizing your desktop real estate. Dell is committed to being the greenest PC company on the planet, and the OptiPlex FX160 delivers, smart energy choices. Intel Atom processors benefit from new 45 nm low-power micro-architecture process — which makes the processor energy-efficient — and provide excellent single application productivity. Help reduce power consumption — and cost — with Dell integrated power supply, which is up to 87 percent efficient. The OptiPlex FX160 is designed to meet ENERGY STAR and EPEAT-Gold certifications with select hard drive configurations.